If you love movies, join a discriminating group of cinephiles to share coffee, conversation, critique, and an advance screening of the latest offering from a roster of prominent independent, foreign, and American filmmakers. Screenings will be limited and only offered on designated dates during the off–season, to be announced prior to each Sunday play date. Season passes will not be available for the Off–Season. The aroma of piping-hot, fresh-brewed coffee welcomes you to the Naro. All other concession items will also be available for purchase. 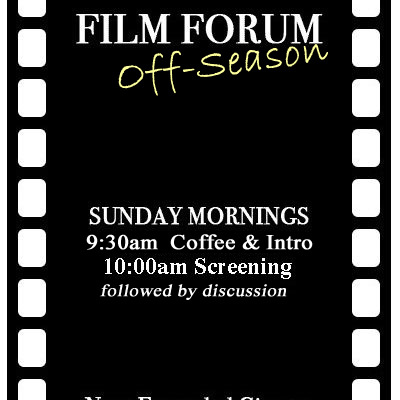 Brunch will not be included during the Off–Season film events. Find your favorite seat to settle into and join our Film Forum hosts: William Laderberg, Michael Khandelwal, Greg Raver-Lampman, Barbara Gardner, Rick Hite, and Fred Levy. Share your own opinion with our guest hosts. Single Film Sunday admission – $10 purchased at the door. No advance season membership pass is available for the Off–Season. Discount ticket books are valid for Off–Season. *Note – film titles are not published in advance, but we usually will reveal the upcoming movie here in the week leading up to its Forum showing. Click here to find out the title of the next First Look film.